Free admission; public welcome. Refreshments will be served. 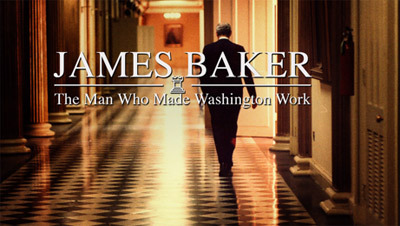 Narrated by Tom Brokaw, James Baker: The Man Who Made Washington Work explores the life and long political career of James A. Baker III, a remarkably savvy power player, dealmaker and diplomat respected on both sides of the aisle for his ability to get things done. Now 84, Baker was instrumental in getting three presidents elected, served in top posts for two of them, and was a central player in some of the most momentous events of the late 20th century. As Secretary of State, Baker brought the Cold War in for a soft landing, working alongside Mikhail Gorbachev and Eduard Shevardnadze to maintain stability in Eastern Europe. In addition, he put together the unprecedented coalition of nations that fought the first Gulf War. On the heels of that success, he organized the Madrid Peace Conference that brought Arab nations and Israel to the table for the first time in modern history. In 2010, he was awarded the Great Negotiator Award by the Program on Negotiation at Harvard Law School and the Future of Diplomacy Project at Harvard Kennedy School, in recognition of his remarkable skill as a negotiator. Written, directed and produced by Eric Stange with John Hesse as Executive Producer, James Baker: The Man Who Made Washington Work will premiere on Tuesday, March 24, 2015 on PBS. Eric Stange (Writer/Director/Producer) is a documentary filmmaker who specializes in historical subjects, and in new media forms of documentary storytelling. His films have appeared on PBS, The Discovery Channel, the National Geographic channel, and the BBC. Previous films include The Wall – A World Divided and After The Wall – A World United about the fall of the Berlin Wall and the re-unification of Germany; The War That Made America, about the French and Indian War; and Murder At Harvard, an analysis of historical inquiry through a real murder story. Upcoming film projects include Edgar Allan Poe: Buried Alive. His work in new media includes co-producing an award-winning iPhone app walking tour of historic Boston based on one of his films, among other projects for mobile media.